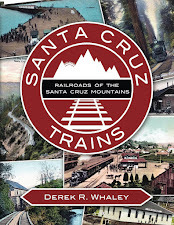 My journey of April 7, 2013, was between Zayante Flag-Stop and Mountain Charlie Tunnel (South Portal) and included visits to the sites of Tank Siding and Virginia as well. The following map charts this route and some of the features that will appear in the photos of this hike. Welcome to the lovely site of Zayante Flag-Stop. There once was a siding, spur, and small enclosed platform here. Zayante Flag-Stop facing east down the right-of-way. Just a grassy clearing these days. Zayante Flag-Stop facing west down the right-of-way. Some Santa Cruz Water District junk sits beside the road. An almost completely buried culvert (reading 1912) just east of Zayante Flag-Stop. The other side could not be found and, based on the assumed perpendicular path of this culvert, has also been buried. A small wooden culvert probably dating to the same time or earlier. Located just a little east of the previous culvert. An undated culvert that nonetheless appears to be of the same type as other ones found along the route. The right-of-way between Zayante and Tank Siding. Still despite infrequent use. Fill rubble in Mountain Charlie Gulch that has slipped out from the right-of-way due to a sink. An old block signal foundation that has been uplifted. Found at the same sink location as the fill debris above, between Zayante and Tank Siding. A small grassy clearing along the right-of-way between Zayante and Tank Siding, facing west. The same small grassy clearing along the right-of-way between Zayante and Tank Siding, facing east. The most westerly of three intact telegraph poles discovered, this was the last one found on the return journey to Zayante Flag-Stop, located between Zayante and Tank Siding, to the west of the Tank Siding washout. Looking at the base of this telegraph pole found a second pole that had been cut off at the base. Weston Properties Escape Road (West), located just west of Tank Siding. This is probably the fabled "Gibbs Station" gate that stretches from the Weston Road properties in Scotts Valley to the right-of-way. It, unfortunately, is not located anywhere near East Creek Road where Gibbs Flag-Stop was located. Tank Siding, facing east, as approaching from a washout. The right-of-way sinks and curves unnaturally in this section just before widening to support the fairly large Tank Siding sidings. The right-of-way looking (west?) from Tank Siding. Unfortunately, I didn't take enough photographs at this site to show the scale of the location. The right-of-way is generally quite wide and there is a lot of space for the water tower and other support equipment on the sides. A random artifact of recent human interaction, a California scientific team is apparently gathering data at Tank Siding using this monitoring device that has a motion (or light) sensor on its face. It didn't seem to be doing anything. Tank Siding facing west. Here the large grassy field at left (south) can be noticed. Tank Siding facing east. The field is now somewhat behind me and to the right. Overgrown right-of-way east of Tank Siding, facing east. Narrow right-of-way passage between Tank Siding and Virginia, facing east. Discovered on the return journey, this pole and its pair located just down the right-of-way, were both on the northern side atop a low shoulder. Apparently H.A. Christie's firm didn't find it worthwhile to remove poles on high places. A rail and a cut telegraph pole in a heap beside the right-of-way. This was the only rail that was found along this stretch of former tracks, though numerous telegraph poles remains were discovered. Grassy right-of-way between Tank Siding and Virginia, facing east. Grassy right-of-way between Tank Siding and Virginia, facing west. A narrow passage on the right-of-way between Tank Siding and Virginia, facing east. The first pole discovered on the return journey. Between Tank Siding and Virginia. Another culvert just before the Virginia Flag-Stop crossing. The top was not accessible to check for dates. Why did the Wild Turkey cross the right-of-way? To show everyone where Virginia Flag-Stop is!!! Virginia Flag-Stop still exists as a wide clearing where a private driveway crosses over the Santa Cruz Water District access road. The right-of-way continues, unmaintained, straight ahead east, above, while the driveway wraps around to the left. This driveway probably was a connecting wagon or skid road for hauling lumber around the turn of the 19th century. The Virginia clearing looking west. The right-of-way continues behind the tractor and is blocked by a SCWD gate, though neither are visible here due to the tractor blocking the route. The driveway continues up the hill and around a turn, presumably terminating on Mountain Charlie Road which runs along the ridge. A broader view of the Virginia Flag-Stop clearing, showing the space for a short siding to hold waiting lumber loads. The much more heavily overgrown right-of-way east of Virginia. The driveway is just visible downhill at left. The right-of-way becomes increasingly unnavigable the further from the driveway you walk. Facing west. The extremely overgrown right-of-way east of Virginia, facing east. The overgrown right-of-way east of Virginia, facing west. Another upturned block signal foundation, though the reason why this one has been pulled is unknown. I presume it has been sitting this way since it was first removed 70 years ago. Looming through the brush, an ominous monument to modernity stands abandoned. What is it? Why, it's Mountain Charlie Tunnel's south (west) portal! And it looks as good as it probably did 71 years ago when it was first dynamited...well, except for the massive pile of sand pouring out of its mouth. Climbing up inside, here is a view of the hole through which brave explorers once were able to climb to access the hidden depths of reopened tunnel. A single window of light brightens the interior, a hole that long ago rotted through the ceiling just beyond the cement. But the tunnel portal still has a lot to offer, so let's check it out some more. First off, here is a rotten support beam that is partially buried in the rubble near the top of the pile. A second, more intact beam sits beside an infant redwood tree outside the portal. A view from inside the portal looking out shows just how much the redwood saplings are retaking the right-of-way. In bold print stamped at the top of the portal are the numbers "1908" signifying the year this portal was completed. A pair of small banana slugs chill out in front of the tunnel. They've been a constant companion on this journey. The tiered molding on the sides of the portal are very interesting, though I don't entirely understand their purpose. I don't entirely remember seeing this style at other portals along the route, though most others have their sides buried. Both sides of this portal has its wings exposed. View from the top looking down. Not much to see except redwood saplings and moss. On the climb up to the top of the portal, this ceramic pipe was found, apparently diverting water from a culvert. ...as can be seen here, looking down on the right side of the portal, which is completely exposed. Interestingly, just above where the piping was no longer connected, the hole through the ceiling could be found. In 2010, I explored this portal and was able to access the interior. A large area above the tunnel's right-of-way was opened up to the elements and accessible both from inside, by climbing over two debris piles, and from the outside by hiking through this. All of the brush and branches are new but the original sand hill can be seen in the background, much further back than it was three years ago adding emphasis to the fact that this tunnel most certainly collapsed again. It's a wonder that it survived daily train operation for 60 years! That's all for this journey, but I have many more that I will be working on in coming weeks to post. Please feel free to comment and give me your input and observations. Disclaimer: The accuracy of the geographic locations on this map are estimates based on photographs taken during the hike. Specific memories or assessments may be incorrect. I apologize for any such oversights. All photographs taken by myself or my wife on April 7, 2013. Next time you go on a trek like this, I'd love to come with you. This is interesting stuff. Great photos, Derek! Thanks for sharing. Like Harold, I would be interested in joining you at some time in the future. Very well done, Derek. Thank you. Well done! 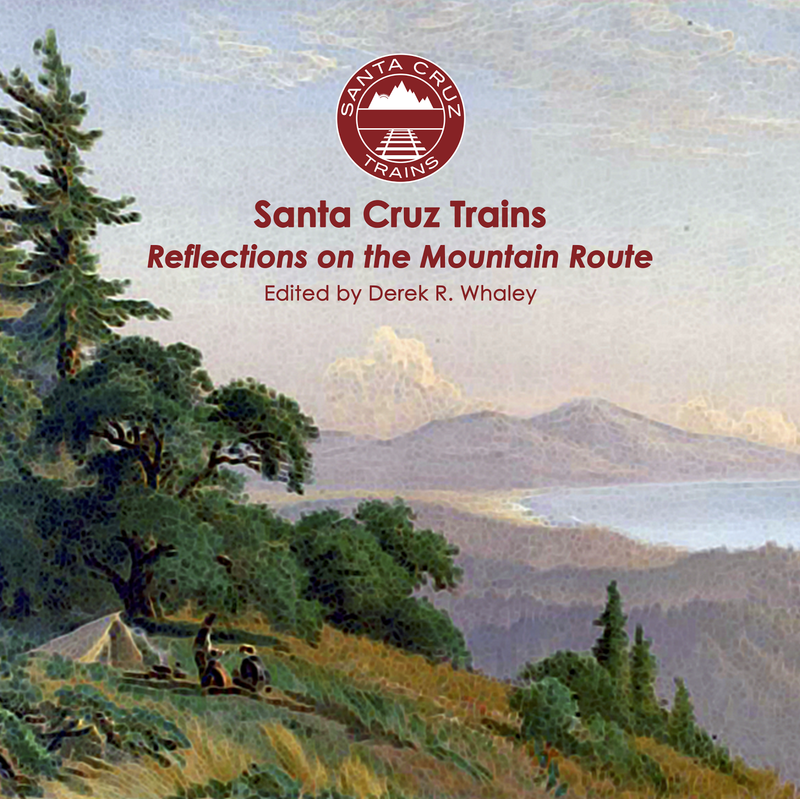 You've finally cleared up the mysteries of Virgina, Tank Siding and Zayante! Any idea where they got the water from for Tank Siding? It looked awfully dry around there when I hiked past that spot last year. I assume that Mountain Charlie Gulch provided the water. It was actually pretty damp all around when we went up there, though it had rained recently. I bet the water tower tapped the source of the gulch. It would have had to go uphill, though. at the Mission Hill tunnel in Santa Cruz. Thank you for the comment, Doug, and welcome to the site. I don't think I've seen you here before. I would politely recommend commenting on the appropriate post to keep things together, but thank you for the information all the same. My only concern with that being a tunnel repair car is I haven't seen one before and, from what I understand, there is no spur or siding where that tower is built, or at least I have never noticed one before. Do you have a comparison photograph of a tunnel repair car that I could see? That would be great for reference. Thanks! Thanks for your work. Too bad about the 2011 cave-in. I found the south portal from climbing through the woods from Glenwood back in 2004. I went into the tunnel for perhaps a hundred feet and captured a few photos, including some pretty well preserved timbers. Hey Milo, I have some photos of the inside that Brian Liddicoat sent me a while back. Assuming those are not actually yours, I'd love to see what you've got. This is the only tunnel that has been photographed internally lately except for the Mission Tunnel. That gives any photos of the interior a high importance. Email me anything you have, if you are willing, to the address above. Also, how did you manage the climb from Mountain Charlie Road? My friends and I tried but didn't have much luck. Now the entire area above the tunnel is a mess, too, so I'm not even sure if that journey is possible without risking falling into the slide. This specific hike doesn't require permission from anyone except, possibly, the San Lorenzo Valley Water District, but they won't notice your presence. The right of way here is not owned by any landowners except the Water District.